SACRAMENTO, Calif. (AP) Giannis Antetokounmpo wasn’t the least bit surprised that Milwaukee’s most lopsided win of the season coincided with one of the Bucks’ best defensive games. The NBA’s most improved player last year also issued a warning of sorts to his teammates. The Bucks have been erratic at times on both ends of the court this season and had dropped three of four before jumping on the Kings early. Milwaukee coach Jason Kidd credited his team’s defense but also praised the offense. The Bucks shot 59 percent with 26 assists. Eric Bledsoe had 21 points, five assists and five rebounds for the Bucks, who won for the second time in five games. Khris Middleton scored 12 points. Milwaukee led by as many as 36 and won despite not scoring a second-chance point. Antetokounmpo scored 11 points in the first quarter, but was at his best coming out of halftime. He went 6 for 8 from the field in the third, including a rare 3-pointer. It was Antetokounmpo’s eighth 30-point game this season. Milwaukee has won three straight against Sacramento. The Bucks were crisp early, but they didn’t pull away until a 20-3 run midway through the second quarter. 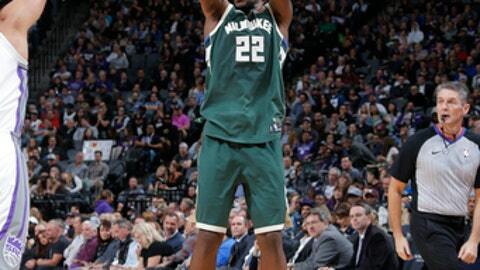 Bledsoe scored 11 during the run, and Middleton made two free throws to put Milwaukee up 61-34 at halftime. Garrett Temple scored 18 for the Kings, and Buddy Hield added 13 points. Willie Cauley-Stein had 10 points and 10 rebounds. Sacramento came out flat and never recovered, one day after rallying in the fourth quarter to beat the short-handed Golden State Warriors. Even after Jason Kidd emptied his bench in the fourth quarter, Sacramento struggled to get the lead under 30. The Kings committed 11 turnovers in the first half and repeatedly allowed Antetokounmpo to get into the paint for easy buckets. Jason Terry, who spent a few brief moments with the Kings in 2014 before being traded to Houston, was booed every time he touched the ball. He made a 3-pointer that put the Bucks up 92-56. Bucks: Middleton was a game-time decision because of illness. … Antetokounmpo `s 3-pointer was only his second make from beyond the arc in the past nine games. … John Henson was charged with a technical foul after hanging onto the rim following a dunk in the first quarter. Kings: Sacramento missed seven of its first 12 free-throw attempts. … The Kings are 0-4 on the second night of back-to-backs. … Rookie De’Aaron Fox shot 2 of 10 and missed all three of his 3-point attempts. Bucks: Play at Portland on Thursday. Kings: Begin a four-game road trip against Chicago on Friday.